The Lotus Blossom stamp set from Stampin' Up! has been sat on my desk for almost a month and while I've used a few of the sentiments in the set on other cards, I've been a bit apprehensive of using the flower stamps! So totally silly, I know! All that changed this morning and I spent a few hours playing and you know what? I LOVE it! Stamp the three step blossoms onto a spare piece of Whisper White, stamping off once for the second and third layers and fussy cut (this is quicker than you might think!). Stamp the two step stems onto the bottom of a panel of Whisper White and layer this onto a Tangelo Twist panel then onto the card base. Attach the flowers with a few glue dots. Stamp sentiment onto Whisper White and punch with the Bracket Label. Layer onto a Tangelo Twist Decorative Label and attach above the blossoms. 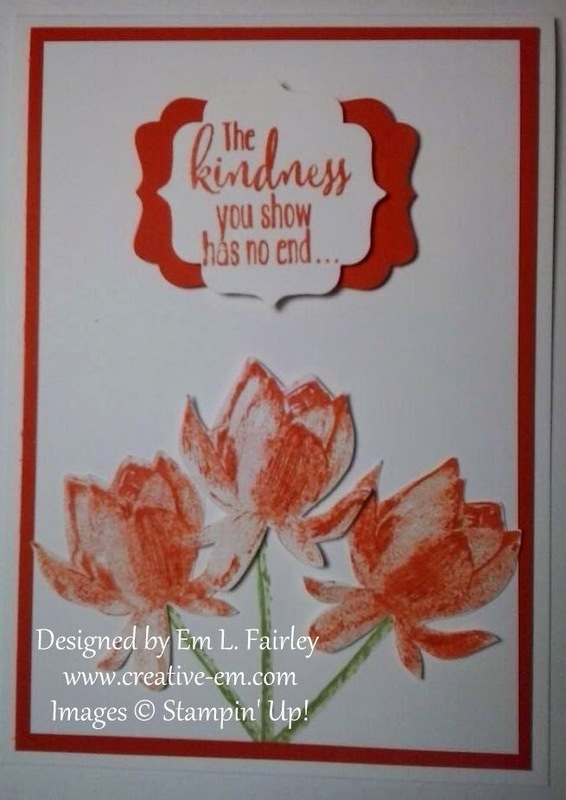 I'll be back tomorrow with another Lotus Blossom creation, so I hope you'll join me then. Labels: Bracket Label punch, Decorative Label, Lotus Blossom, Stampin' Up! It certainly is a gorgeous stamp, and the card is gorgeous too! Such a pretty card! Thanks for playing along with us this week at Can You Case It? Love your card this week! Thanks for playing with us over at Can You Case It?! Pretty card! Thanks for joining us at canyoucaseit.com. I love the colors, beautiful card! I haven't played with this stamp set yet but now I may have to this weekend. Great card, I love the background effect. Thanks for playing along with us at Can You Case it? this week! Wow! The fussy cut flowers are great! I love this set! Thanks for playing along at CYCI?! Beautifully crafted! Thanks for dropping this off by our house here at 613 Avenue Create! We love seeing you in the neighborhood.